Crown Las Vegas, formerly known as the Las Vegas Tower, was a proposed supertall skyscraper that would have been built on the Las Vegas Strip in Winchester, Nevada, an unincorporated suburban community of Las Vegas. If built, the tower would have been 1,064 feet (324 m) tall, making it the tallest building in the Las Vegas metropolitan area and the 2nd-tallest structure in the Las Vegas Valley and in the state of Nevada, after the Stratosphere Tower. 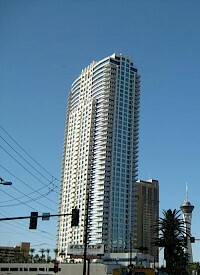 Dynasty Towers is a proposed 559ft (170m) tall skyscraper in Las Vegas, Nevada. If built it will have 63 floors and 542 units. 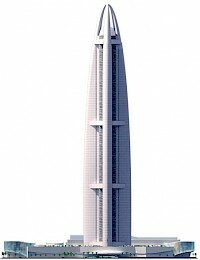 Eighty on Fourth is a 506ft (154m) proposed skyscraper in Las Vegas, Nevada. If built it will have 40 floors and 89 units. Flatiron Las Vegas is a 582ft (177m) tall proposal in Las Vegas, Nevada. If built it will have 50 floors, and 319 units. It was never a proposal but this was developed by an investment company in hopes that someone would buy the project and build it. Las Vegas City Hall is the center of municipal government for the City of Las Vegas, Nevada. It is located downtown, with its main entrance on Stewart Avenue. 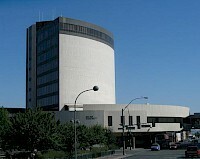 It is cited as an example of 1960s modernist architecture. The original eleven-story central tower was completed in 1973. An addition was completed in 2003 which included a three story surround to the central tower. Marriott’s Grand Chateau, a Marriott Vacation Club resort, is located just off the world-famous Las Vegas Strip and sits between the Planet Hollywood and MGM Grand hotels. Upon completion, Marriott’s Grand Chateau will consist of four 38-story towers, consisting of 256 one-bedroom, 511 two-bedroom and 128 three-bedroom villas, totaling 895 two- and three-bedroom villas. 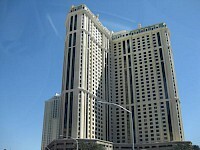 The Renzi Towers are a set of proposed towers in Las Vegas, Nevada. 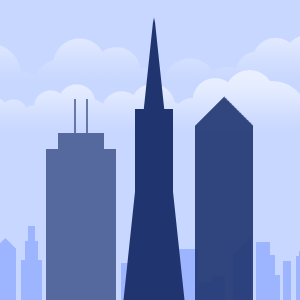 Kobi Karp designed the buildings, which will have 63 floors. If built it will be the tallest building in Las Vegas and have 1,011 units. Sky Las Vegas is a 500ft (152m) skyscraper in Las Vegas, Nevada. It was built from 2005 to 2007 and has 45 floors. Klai Juba Architects designed the building, the civil engineer for the building was The Keith Companies, the structural engineer was Lochsa Engineering, and the owner and developer is Nevada Development Partners. It has 409 units that range in price from $656,000 to $3,699,000. It is the 16th tallest building in Las Vegas.